we love to work with. A big update to my portfolio is coming up VERY SOON with a bunch of exciting new work posted. 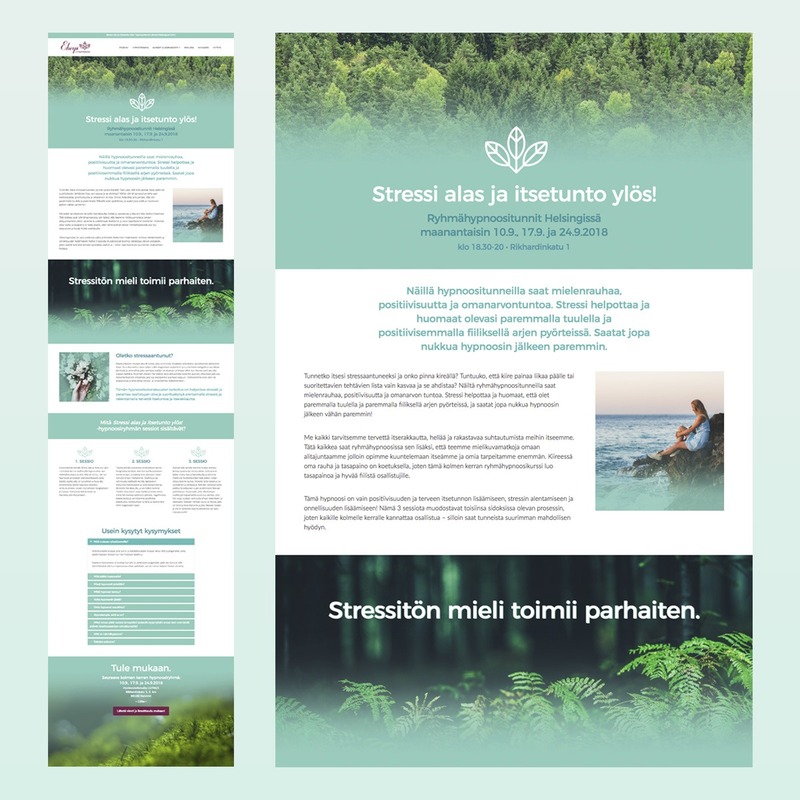 Eheys offers hypnotherapy in Helsinki and the website is an overview of the services. We just added two pages (pics above) of new courses. The first is a Dream Workshop with soft, gentle feel, yet energetic enough to activate some serious dreaming vibes. The second is a nature inspired course for releasing stress and building confidence. Besides web design, we created the branding, logo and other print marketing materials. 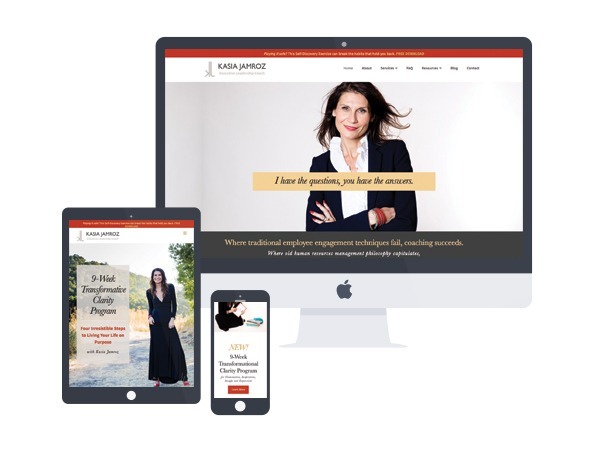 Kasia Jamroz is a Conscious Leadership Coach. She transforms organizations one person at a time. Her branding needed an injection of femininity and inspiring spirit yet keeping the overall mood relatable to her corporate audience as well. 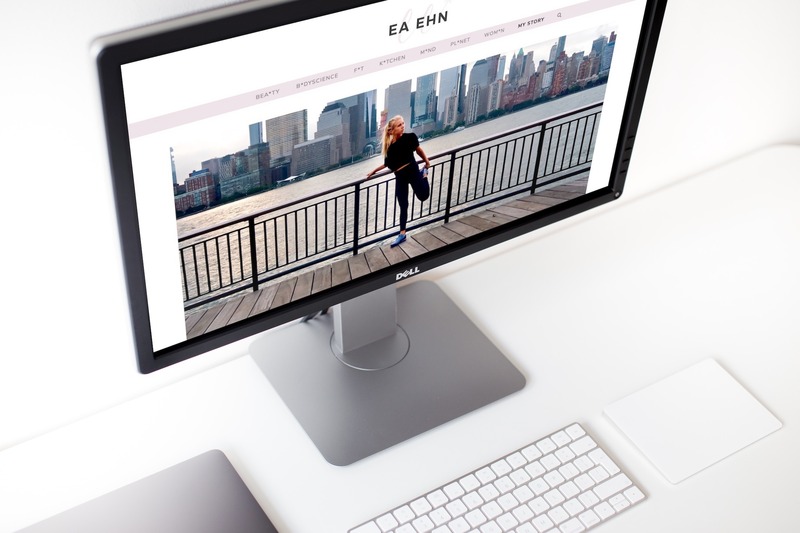 We planned her photoshoot to make sure we got the perfect images for every aspect of her brand, and co-created online surveys for her clients. 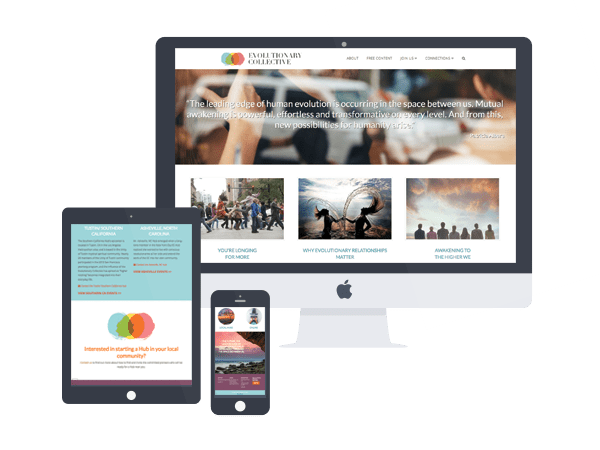 I created her updated branding, website, PDF materials, banners & post templates for social media, ebook, automated email campaign, logos for other projects, and more. 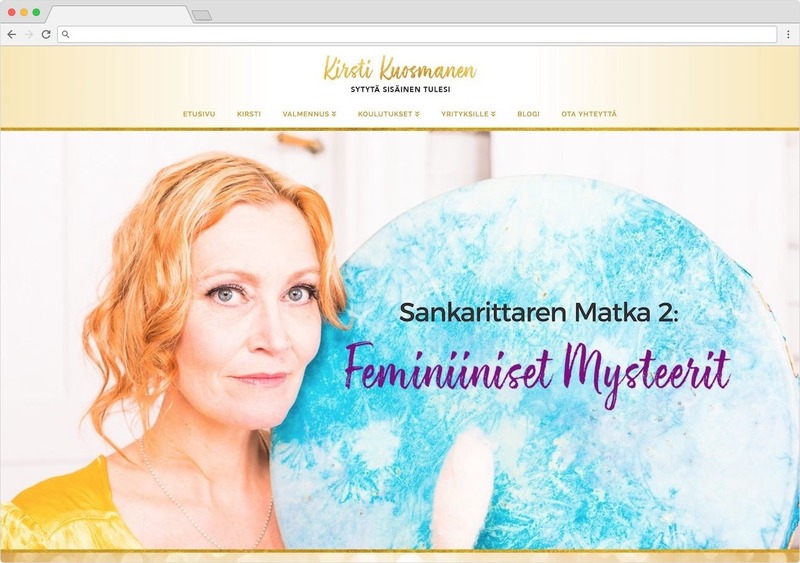 Karita Aaltonen is a speaker, author, yoga teacher, coach and inspirer of people. 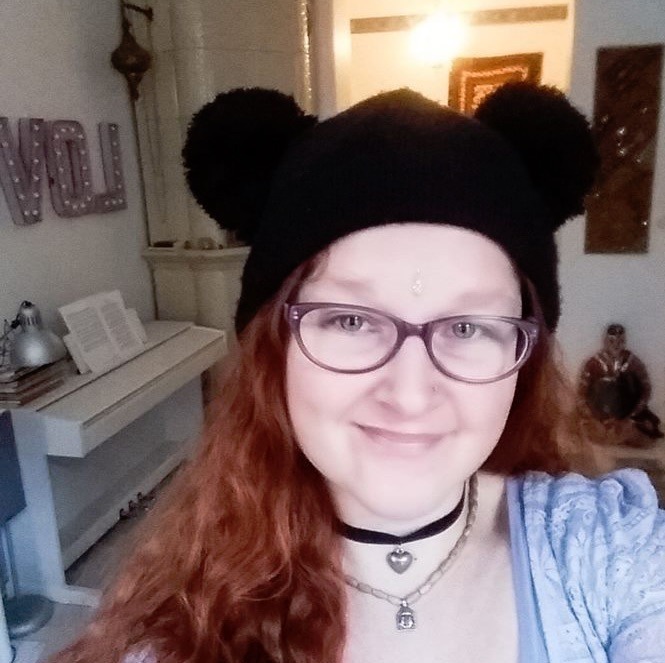 Her powerful story of healing from most serious brain tumors – twice – has touched people widely in Finland and beyond through TV interviews, magazine articles, and her new book that’s coming out soon. 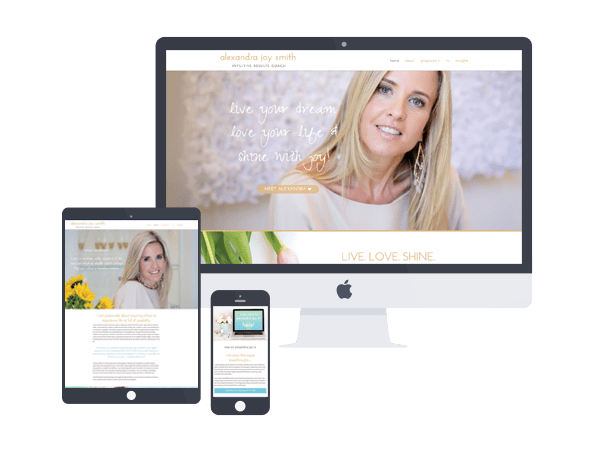 We wanted a bright, positive and hope-filled look and feel for her website which showcases all her offerings, upcoming events, blog posts and more. We streamlined and updated the look of her Facebook banners, logo and overall brand too. 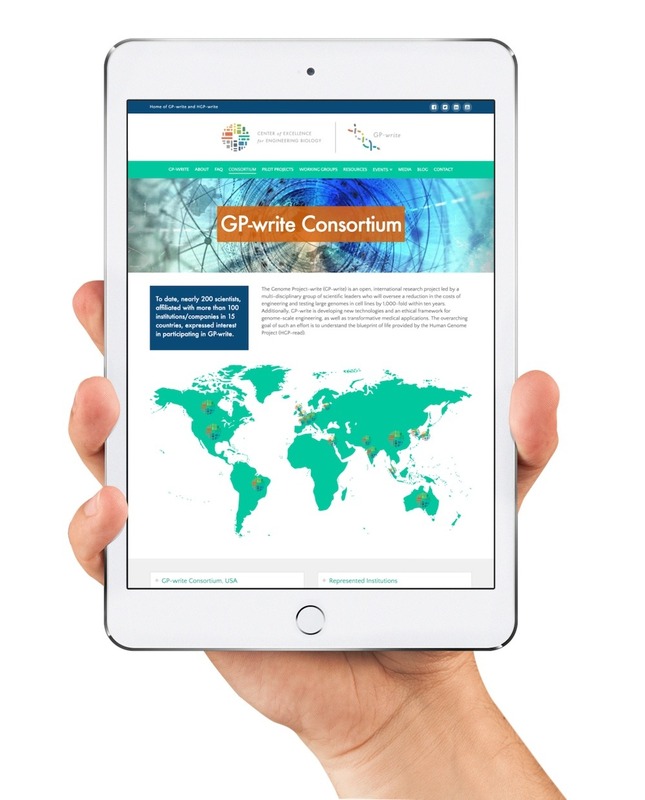 The Center of Excellence for Engineering Biology is the home of GP-write, a new international research project led by a group of scientific leaders. The launch of the project was covered by 195 news outlets worldwide garnering over 91 million impressions – woah! 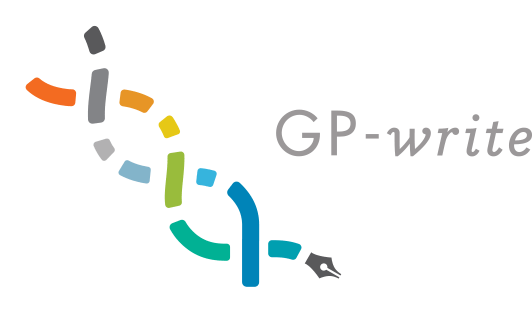 As GP-write develops, the design needs grow as well. 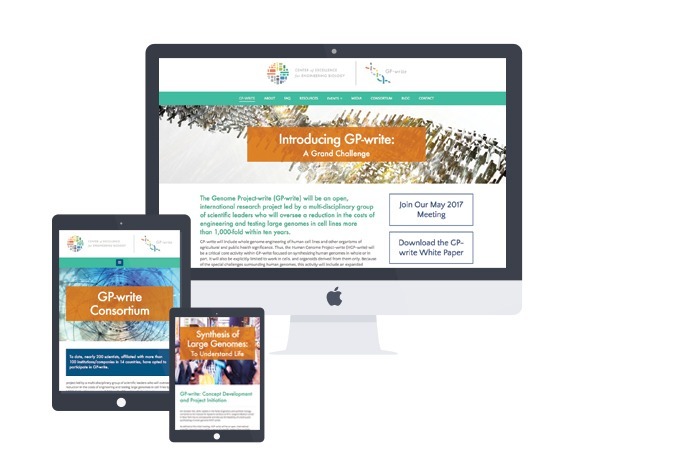 So far we’ve created the website with branding, PDF materials, banners for social media, mobile app customization for the scientific meetings, email campaigns with Mailchimp, and more. Henna Lansipaa is a coach, speaker, producer, visionary, and an all around inspirational human. 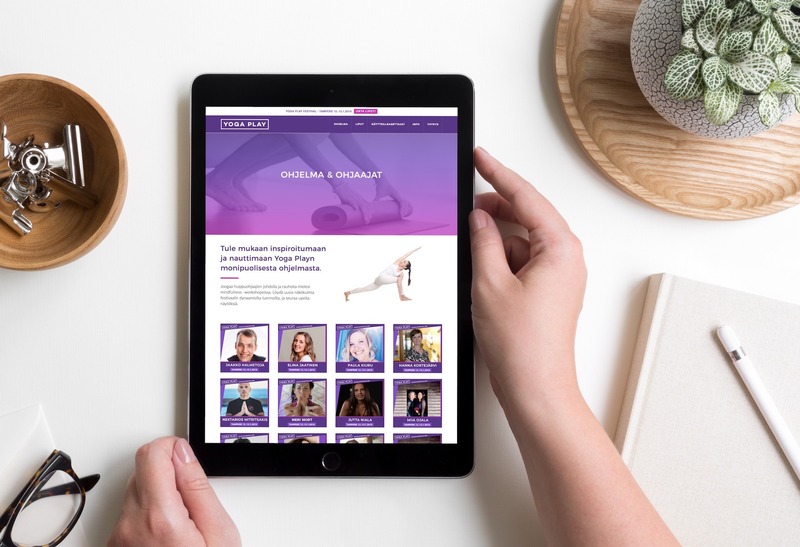 She offers training for laughter yoga teachers, arranges soulful events and festivals, inspires companies with talks and team days, and offers one on one coaching to live your dreams. 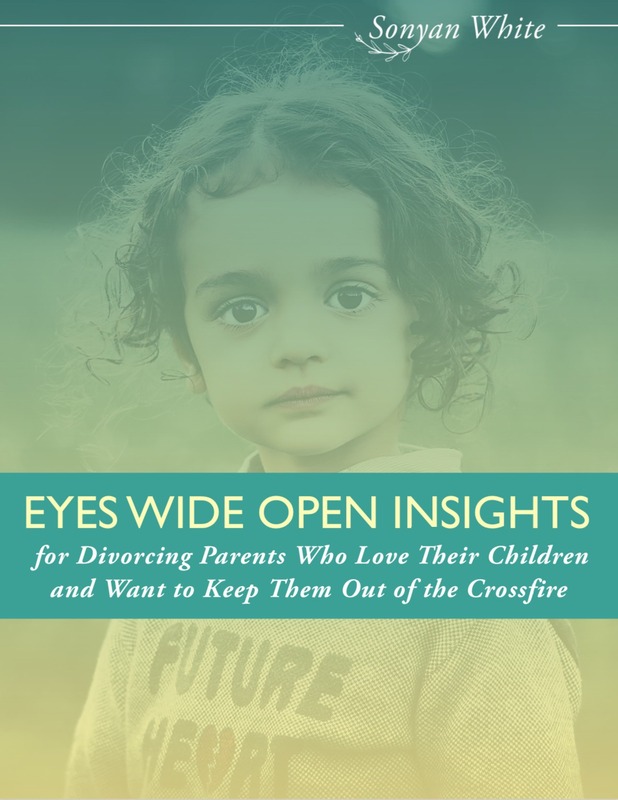 Conscious Uncoupling process was created by the bestselling author and love-olutionary Katherine Woodward Thomas. 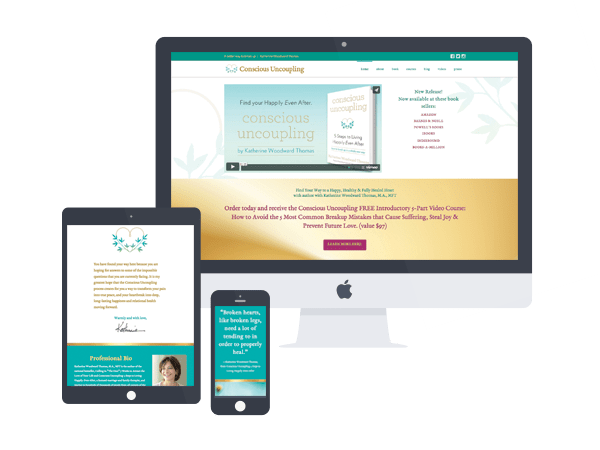 The Conscious Uncoupling website, designed & developed by Bhakti Creative, promotes the newly released book and offers resources for finding your “happily even after”. A concept made famous by Gwyneth Paltrow, conscious uncoupling is a new pathway for those suffering through a breakup or divorce; one characterized by goodwill, generosity and mutual respect rather than hostility and bitterness. Marika Krook is a singer, actress, composer and producer with decades of experience in arts and entertainment. Although the media has written about her throughout her career, she’s never had a website of her own. Marika simply isn’t into computers, social media and such. That’s where I step in! :) We had meetings over espressos and I took charge of the process without her needing to do anything else except approve final versions & give feedback. Easy breezy! I created her branding, website, and PDF designs. We continue to make digital strategy plans and materials for marketing her projects in ways that feel fun and natural to her. Jordan Adler is an entrepreneur, speaker, motivator & author of the bestseller Beach Money. Jordan’s new website matches his friendly, colorful & cool personality. With the re-branding we wanted to reflect his bold approach of going for his dreams, the grander the better, and inspiring others to do the same. It’s all about creating the lifestyle that sets you free and then showing others how to do it too. Growing his networking community is an important goal for Jordan so we set up lots of optins and invitations to share & join on social platforms. NJKA is behind some major scientific projects in New York and beyond, and is committed to delivering scientific and medical breakthroughs through advancing genomic research and facilitating ways to feed, fuel and heal the world through technological innovation in biology. 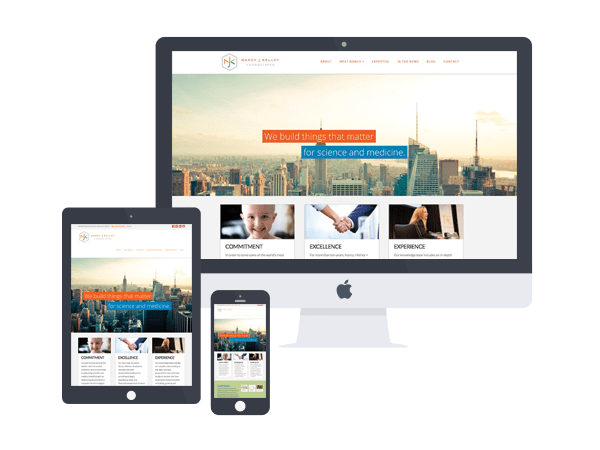 They are an accelerating force on the edge of what’s developing in their field, and the website reflects the passion, sophistication, reliability and vast experience. 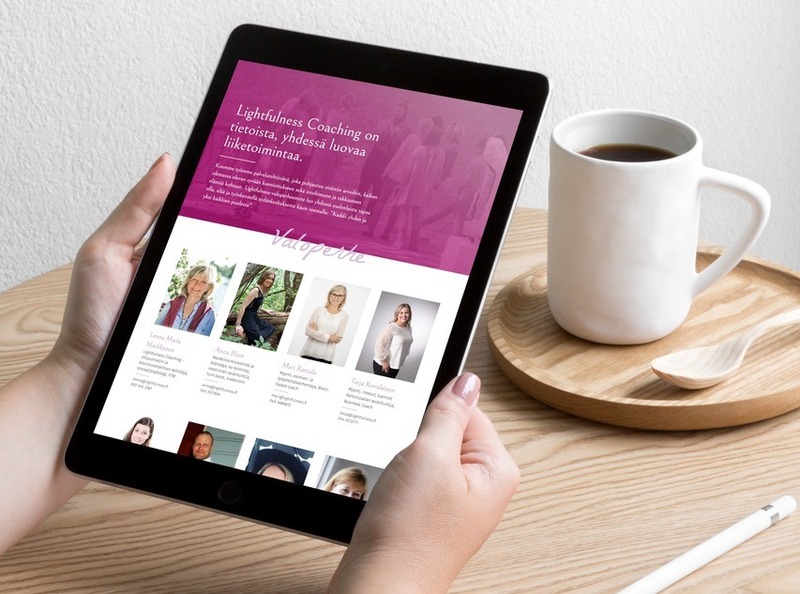 In her own words, intuitive coach Alexandra Joy Smith “helps women rock the world with their dreams and purposes so that they can shine in a life they love.” The redesign of her website and rebranding of her visual identity reflect her bright & positive approach. The look is feminine, elegant and friendly – just as Alexandra. 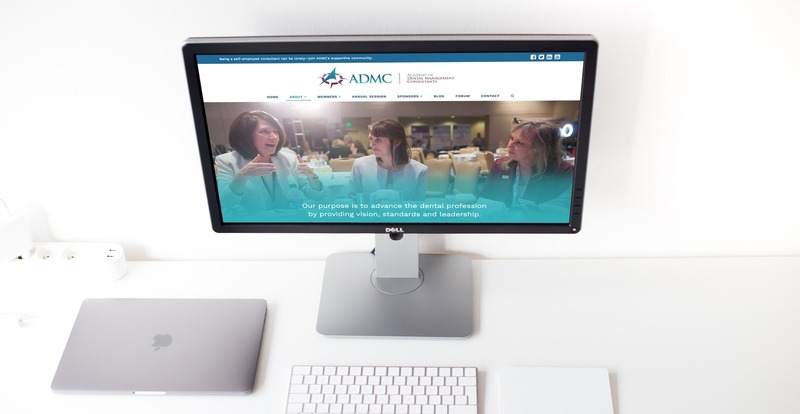 We gave a new fresh look to her existing courses and programs to match the new website, updated the logo, and created graphics for social media branding as well. Tim is an interesting guy – a scientist, tutor, and a vegan yogi. 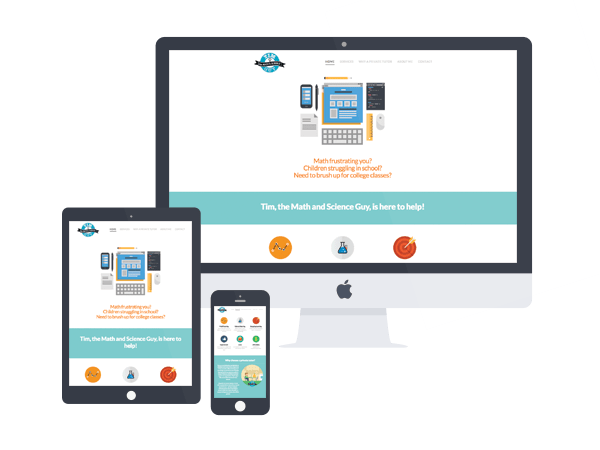 I created the brand identity, logo and a dynamic one page website for him to advertise his tutoring services. 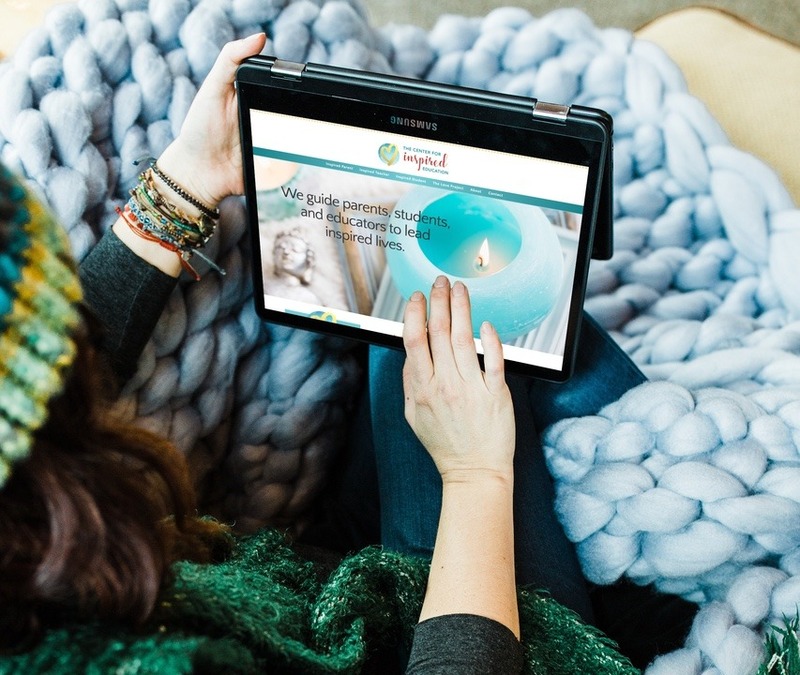 The site is colorful, fun, and to the point, designed to attract both younger audience – the kids! – as well as to impress their parents. View Your Vegas Tutor website. The Evolutionary Collective is a global community with hubs in New York City and the Bay Area in California. 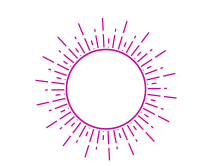 Through orientations, retreats, and online courses, The Evolutionary Collective comes together to embody the highest potentials for human consciousness, culture and spiritual awakening. 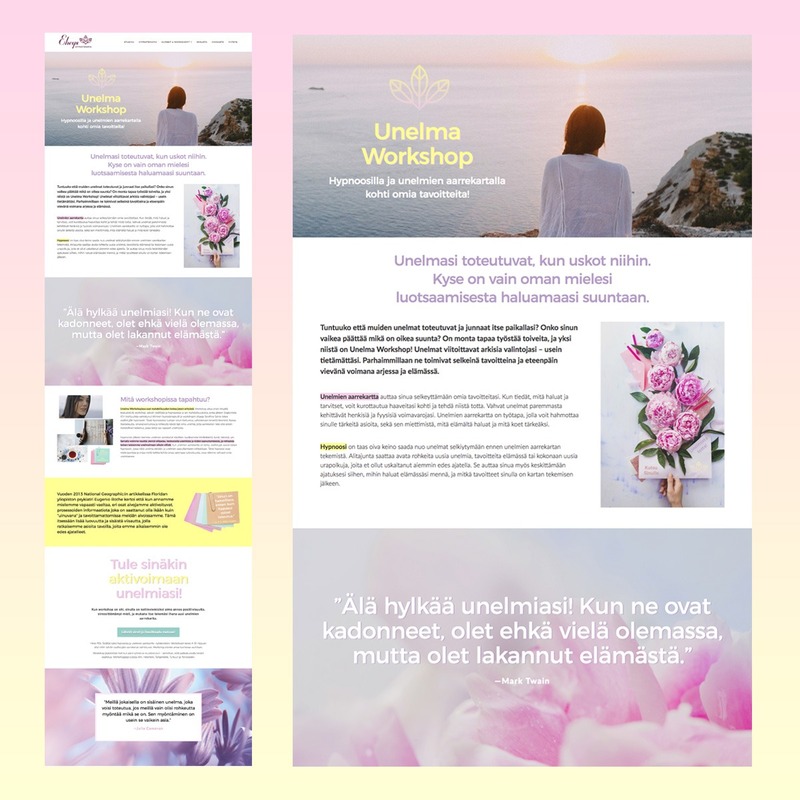 Ecommerce website design for eco-conscious wellness brand Gopala from Finland. They are beekeepers and artisans, providing products from honey, body lotion, and lip balm to homemade fudge. 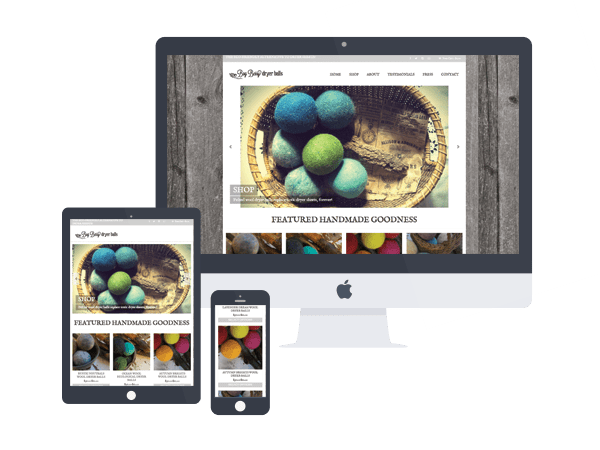 Brooke, the crafter behind Bog Berry Handicraft, wanted her website and online store to represent her ecological lifestyle and rustic esthetics. I designed old-timey digital labels that Brooke prints for her products according to her needs. 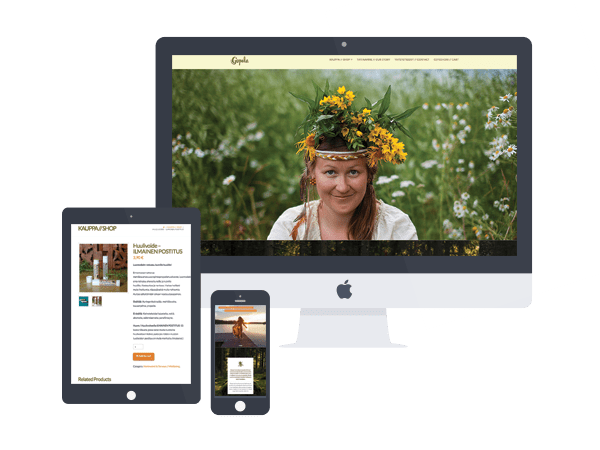 In addition we worked on her brand, designed the logo, business cards, flyers for farmers markets, banners for Etsy, and provided some of the photography to create a full, consistent visual identity. Ummm, I want to tell you this. 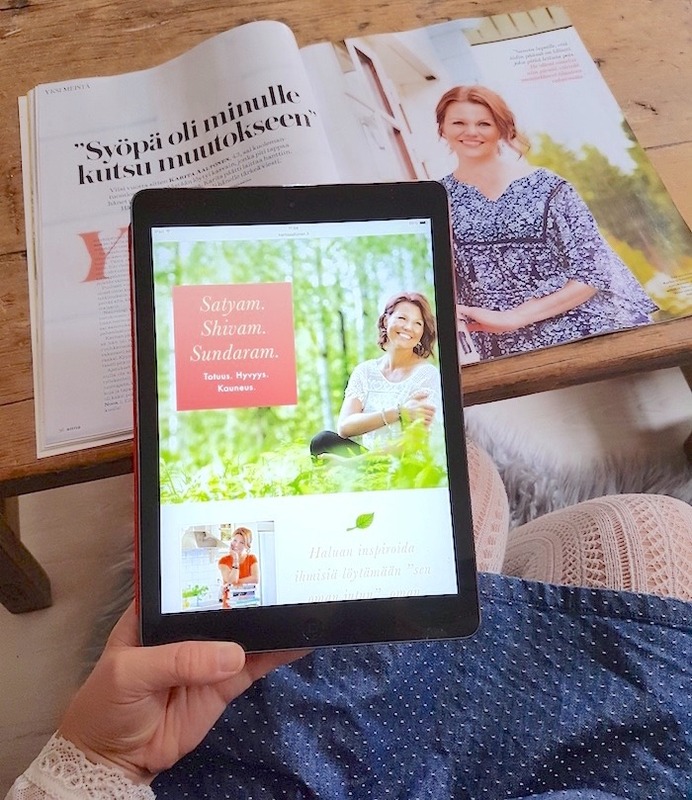 I also do many other projects like design beautiful ebooks, marketing materials like brochures, banners for ecommerce stores, social media graphics, PDF packets for speakers, email campaigns… So much work I’m proud of but probably won’t have time to display here any time soon. Just needed to get that off my chest. If you’d like to work with me but don’t see a match for you need, the chances are I can show you more work that will help you see if we’d be a good match.